"Broken City" may proud itself with a star-studded cast and beautiful sweeping shots of New York City. But even with all the dazzle and glamour it presents to its viewers, it fails to hide the fact that it is truly a "broken film" - one that completely fizzles out and never proves to be interesting. Historically, "Broken City" has been in development hell since 2008. The final product proves that it should have stayed that way. NYPD detective Billy Taggart (Mark Wahlberg) is arrested for the murder of Mikey Tavarez, who raped the sister of Taggart's girlfriend Natalie Barrow (Natalie Martinez). His friend, Captain Carl Fairbanks (Jeffrey Wright), asks Mayor Nicholas Hostetler (Russell Crowe) help in eliminating new found evidence that proves Billy guilty of abuse of power. Hostetler easily eliminates the evidence against Taggart and eventually, Tavarez's death is ruled as self-defense. Seven years later, Taggart is now a private detective on the verge of bankruptcy. Fortunately for Taggart, he is hired by Hostetler to find out who his wife Cathleen Hostetler (Catherine Zeta-Jones) is having an affair with. Helped by his assistant, Katy Bradshaw (Alona Tal), Taggart learns that Cathleen is seeing Paul Andrews (Kyle Chandler), the campaign manager of Hostetler's rival in the upcoming elections, Jack Valliant (Barry Pepper). As soon as Taggart presents the evidence to Hostetler, Paul Andrews dies due to an assassination. Taggart must now find out if Hostetler was really looking for the man "playing" with his wife or something more deeper and sinister. On paper, "Broken City" should have worked out well. A star-studded cast with a history of notable performances and a story that sounds interesting enough. But the final output is far from expectations. Surprisingly, the film bodes well in terms of acting prowess. The main leads especially Russell Crowe and Mark Wahlberg did great as well as the supporting cast. The script also had some memorable one-liners mostly from Mayor Hostetler. 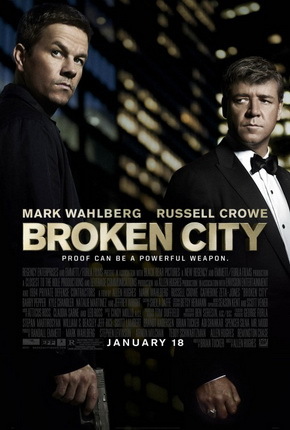 Unfortunately, what completely breaks "Broken City" is the uninteresting overall arc. We never felt shaken or moved by its surprises or never did we feel getting involved with the story. They really botched this one and great acting and even wonderful cinematography couldn't salvage this film. Ultimately, "Broken City" feels mediocre at best. This film is a recommended pass.